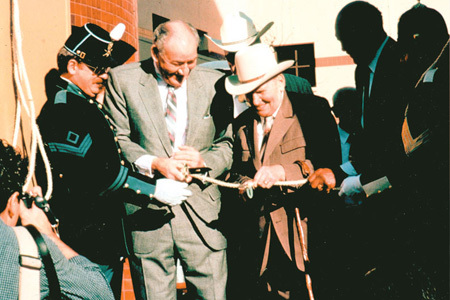 Gene Autry during the rope cutting ceremony with Los Angeles City Councilman John Ferraro (left), Gene Autry, and Los Angeles Mayor Tom Bradley (right). Los Angeles, CA (June 11, 2018)—The Autry Museum of the American West (then the Gene Autry Western Heritage Museum) opened its doors to the public in 1988 with the goal to collect, preserve, and interpret materials related to the history of the American West. Throughout the last 30 years, the Autry has continued and extended its founders’ vision by offering a wide array of exhibitions and public programs exploring the West’s art, history, and cultures, ranging from its annual American Indian Arts Marketplace to vibrant exhibitions such as Play! (2017), Route 66: The Road and the Romance (2014), and How the West Was Worn (2002). To celebrate the museum’s 30th anniversary this fall, the Autry will host special events and programs—including a private concert by Willie Nelson, talks, screenings, special offers, and more. Taking a walk down memory lane, the Autry Store will offer limited-edition, 80s-themed commemorative memorabilia featuring the original, now-vintage Autry logo. Founded by Jackie and Gene Autry and Joanne and Monte Hale in Griffith Park, the Autry is committed to bringing together the stories of all peoples of the American West, connecting the past with the present to inspire our shared future. The museum offers visitors world-class galleries filled with Native American art and cultural materials, film-related artifacts, historic firearms, paintings, and more. Throughout the year, the Autry presents a wide range of public events and programs—including lectures, film, theater, festivals, family activities, and music—and performs scholarship, research, and educational outreach. The Autry spans three campuses in Los Angeles: the Autry Museum in Griffith Park, the Historic Southwest Museum Mt. Washington Campus, and the Resources Center of the Autry (near-completion in Burbank). Since its founding, the Autry has grown to encompass a broad and inclusive representation of art, artifacts, cultural materials, and library holdings. In 2002, the Autry merged with Women of the West, a nonprofit organization highlighting the impact of diverse women’s experiences on the history of the American West. In 2003, the Autry merged with the Southwest Museum of the American Indian and began an extensive effort to document, conserve, and preserve more than 250,000 ethnographic and archaeological materials in the historic collection. As the extensive preservation project entered its final phase in 2015, the National Trust for Historic Preservation named the Autry’s historic Southwest Museum Mt. Washington Campus site a National Treasure, launching a collaborative process to identify a long-term sustainable future for the Los Angeles landmark. For more information about upcoming 30th Anniversary programs and events visit, TheAutry.org/30Years. Saturday, September 29, 10:00 a.m.–5:00 p.m. Celebrate our museum’s founder and enjoy a complimentary piece of birthday cake in Crossroads West Cafe. General adult museum admission is only $9.29 to mark this special occasion. See films with varying views of the American West from the year the Autry was founded–1988! Saturday, August 18, 1:30 p.m.
Saturday, September 15, 1:30 p.m.
Saturday, October 20, 1:30 p.m. While making a silent film about the life of the legendary lawman Wyatt Earp, veteran actor Tom Mix (Bruce Willis) discovers that the real Earp (James Garner) is on the film set as a technical advisor. The two become friends, but when a murder takes place, the two become partners and set about tracking down the killer. Saturday, November 17, 1:30 p.m.
At this Autry fundraising event, enjoy cocktails, dinner, a live performance by Willie Nelson, and an after party under the stars with live music and dancing. Visit TheAutry.org/Celebrate for more details. In celebration of the Autry’s three decades in Griffith Park, the museum is transforming one of its core galleries into an experimental, hands-on space dedicated to the land on which it stands, Griffith Park. In the coming years, this gallery will evolve through public feedback and ideas to become a full-fledged exhibition by the park’s 125th anniversary in 2021. Wednesday, November 21, 10:00 a.m.–4:00 p.m.
Rewind to 1988 and pay original museum admission prices from the day the Autry opened (Adults: $4.75; Seniors/Students: $3.50; Children (2–12): $2.00). Dress in ‘80s-inspired attire for a special prize. Image: Gene Autry during the rope cutting ceremony with Los Angeles City Councilman John Ferraro (left), Gene Autry, and Los Angeles Mayor Tom Bradley (right).